Designing your own bathroom can sometimes be a hard nut to crack, which is why the following list of great 15 example designs could push you in right direction of choosing the appropriate stuff for your project and give you the insight in current trends. This simple yet effective blend of contemporary styling using transparent glass ball sink, wooden cabinets together with glossy floor makes this modern bathroom an interesting and calm place to clean up. Its operational value is also not left out since the cabinets, longitude mirror and natural lighting are strategically positioned within the room for effectual bathroom experience. Compliment your lavatory space into an elegant style using well distributed LED lighting and brown hues. These features combined offers an almost dreamlike comfort mode which is enhanced further using frameless mirror not leaving out the chocolate brown bath tub support causing an epic feel once you step inside the bathroom. 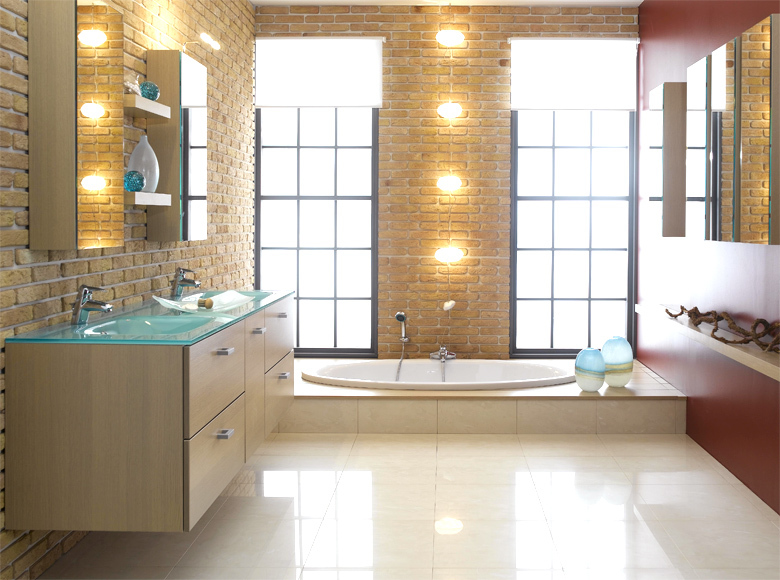 This modern bathroom design is not only luxurious but also offers high-quality accessories with perfectly fitted details around the brick wall. The elegant glass top at the cabinets as well as LED lighting on the wall creates a perfect sense of belonging to visitors. Experience quality cleaning installing this rare piece of art in your home. Forget the large bathrooms built in many modern homes and embrace pebbles around an oval bathtub to relax your feet as you enter the tub. 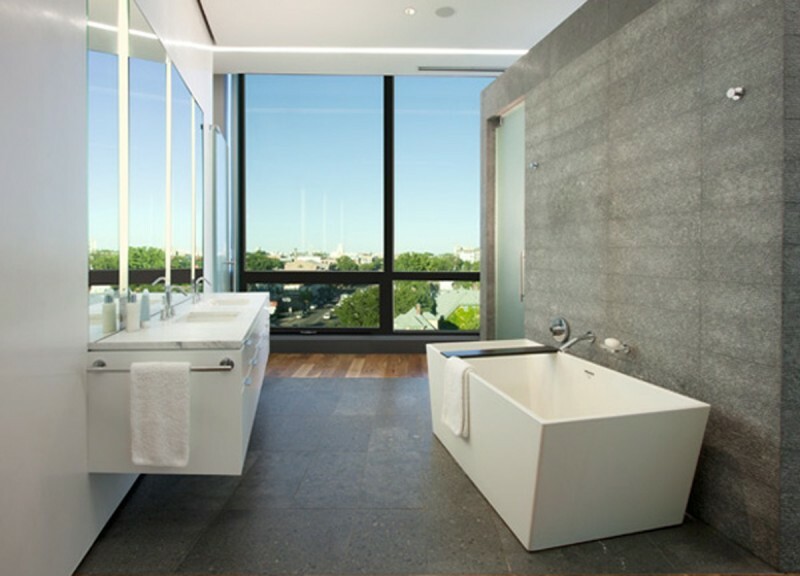 Natural lighting is implemented by the clear wall with blinds next to your bathtub. Brown tiles provide the floor once you are through with the feet massage when leaving the oval tub. 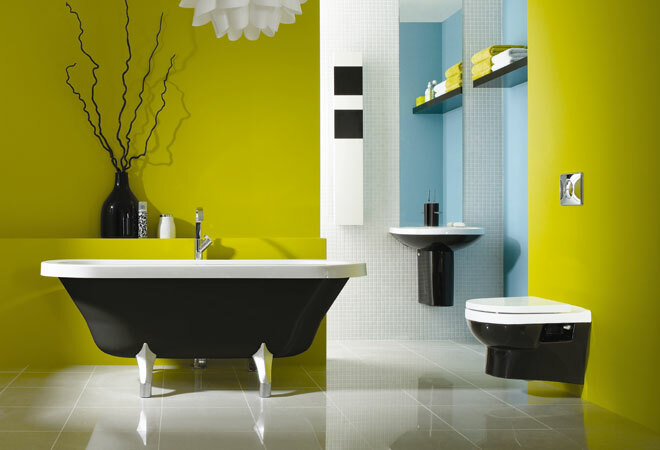 As far as this stylish design is concerned, you don’t need a large space to have a modern bathroom. With proper planning you can turn a small room to a spacious and operational space based on layout efficacy. This will make the place appealing and best of all, leave plenty of room to move freely. The wooden framed wide mirror together with magnificent chandeliers provides even lighting in the room. The artistic marble sink is also a feature that anyone using the bathroom would notice. Imagine having natural color palette complimented with warm materials in your bathroom. As relaxing as it may sound, this can now be possible all credit going to this exceptional design with modern rustic but slick appeal. This trendy design has utilized tiles in many areas with perfect lighting giving it an exclusive feel. 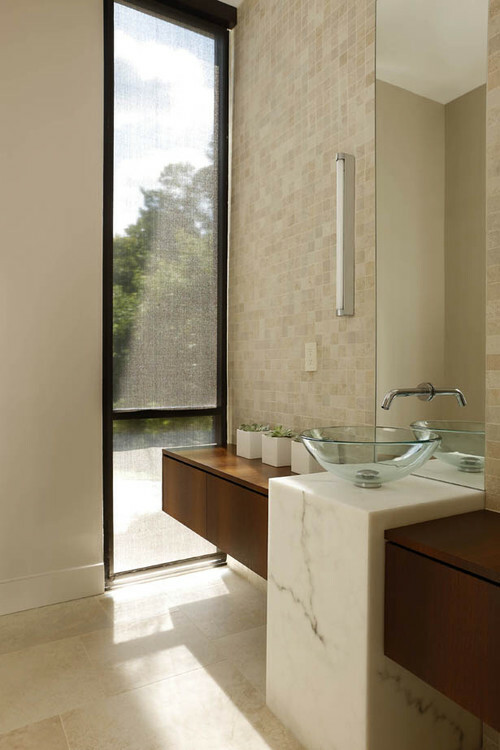 Creating the impression of openness, this luxurious bathroom displays an astounding interior design. The black wall next to the bathtub along with modern glass bathroom furniture harmonizes the whole interior. Each wall has its own unique design including custom fittings and hidden valves. This is a design that encompasses a glass wall together with a number of unvarying mirrors adding more visual space’ in the bathroom. You can relax as you clean up overlooking the outdoor which sets a unique sensory together with an amazing visual experience. The rectangle tub is strategically placed and the cabinets are enough to organize your towels including other bathroom materials. 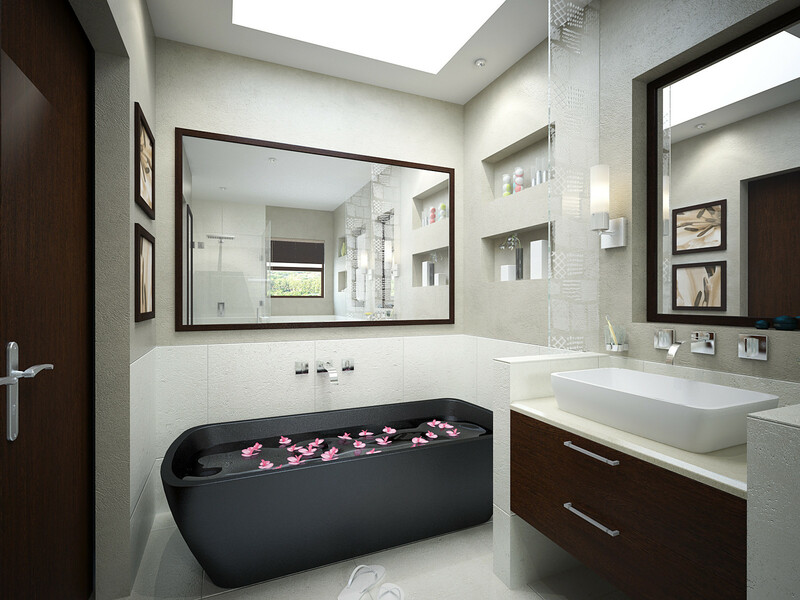 The above bathroom design is recommended for modern home owners wishing to have a cool and ample time during bath. Taking a bath in this rare lavatory design without a tub is definitely an experience compared to none. The design distribution within the room is arty and the red-white blend makes the cost of having this modern bathroom a loveable price. Mirrors are used in this modern bathroom to create an illusion of space. This is mostly done in bathrooms without windows and by carefully working with the given space, more illusionary space can be created from this design. Use of mirrors is super handy when there is poor lighting in the room since it reflects the light providing a well distributed lighting system. Carefully hidden valves, same as in example above, provides functionality without sacrificing carefuly crafted design. Thing about those is that those valves (terminology) are usualy built small and non-resistant in order to provide desired looks so some care should be put into choosing the quality device which also looks good. There are spaces in your house that you think are useless but the above modern design will work for any space, mostly the unusual areas. These atypical spaces can be transformed into intriguing restrooms that are gorgeous and also very operational. Using mirrors including modern bathroom fittings, this art piece of a bathroom is illusionary spacious. This is an up-to-the-minute bathroom design that is accessorized with top creativity to make it colorful and most importantly give the visitor an optimistic feel. There are open shelves to store bathroom accessories such as towels, and the green walls together with the refined tub would make any cleaning process serene. The spa-like environment brought about by this modern design simply causes an ecstatic feel thanks to the textured tiled floor and the oval marble tub. The dark wall offer tranquility to the restroom surrounding, with the large varying circle mirrors complimenting the whole idea. Utilize decorative vessel sink and tiles in your bathroom and see you restroom space transmute to a simple cleaning area that is full of contrasting colors – as seen above – which in itself form a great impression of elegance. 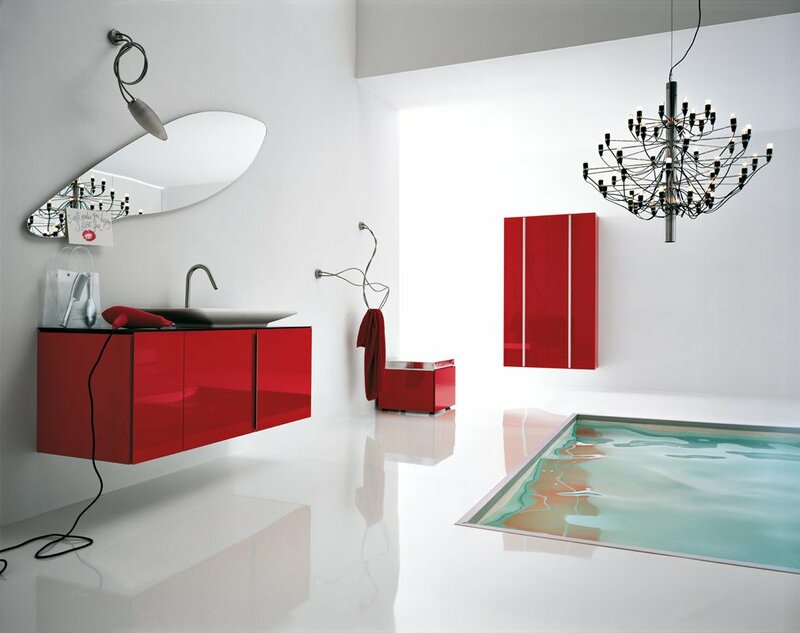 Bring a sense of royalty in your washroom area by using the above bathroom vanity design to come up with a simple yet deluxe feel as displayed by the red floating vanity glass sinks and wide cabinet area. A space ornamentally utilized to the limit. Bathrooms are essential since they provide a functional part of our homes. Whichever modern design you chose for your home, it is very important that you consider every member of the family circle in case it is shared. There are bathroom designs for every specific need depending with the size of the home and that of the family making it your best interest to choose one that suits all. Modern bathroom designs vary drastically in cost, making it important for home owners to prepare a budget depending on what they can afford. A contemporary bathroom should not just be characterized by advanced clutter; everything should be thoughtfully placed to create a relaxing ambience during the most private moments.